Downing Street has said it “does not recognize” German media’s damning account of last week’s Brexit meeting between Prime Minister Theresa May and European Commission President Jean-Claude Juncker. Frankfurter Allgemeine Sonntagszeitung (FAS) reported that Juncker described May as “delusional” and “living in another galaxy.” The full account of the meeting was published on Sunday in the print edition of FAS. 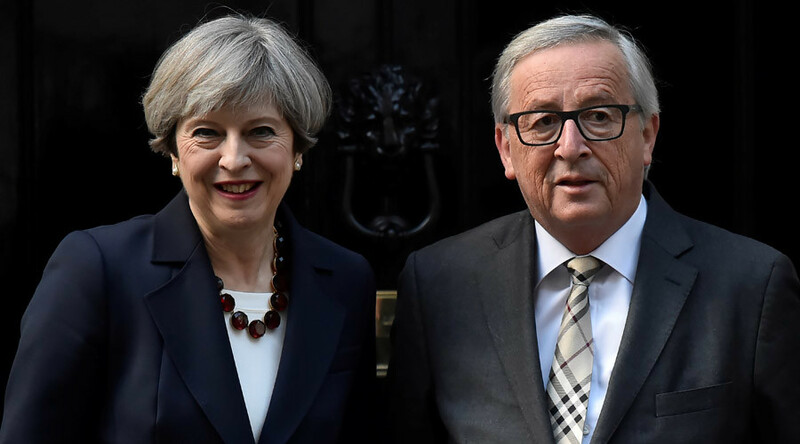 Juncker left last week’s meeting with May “10 times more skeptical” about the successful conclusion of the Brexit negotiations, saying the Prime Minister made no compromises and had unrealistic ideas about the split from the European Union. Juncker reportedly told German Chancellor Angela Merkel that the more he heard from May, the more skeptical he was about the deal. Sources briefed by Juncker after the meeting said he felt the chances of a breakdown in Brexit negotiations were more than 50 percent, FAS reported. The most worrying aspect for Juncker was May’s view that Britain doesn’t owe the EU any money. According to the EU, the UK should be paying between €40-60 billion ($44-65 billion) when it leaves. After May said she would not be forced to pay a “divorce bill” for leaving, she was warned that the EU was not a “golf club” which could be easily left or joined, FAS reports. Following Juncker’s call to Merkel, in which he relayed his concerns about May, the German PM warned against British “illusions” about keeping the benefits of EU membership in a speech in parliament. “As the prime minister and Jean-Claude Juncker made clear, this was a constructive meeting ahead of the negotiations formally getting underway,” a UK government spokesperson told Bloomberg. May reportedly said she hoped to clarify the rights of EU citizens in Britain at the next European Council in June, but that she would not treat EU citizens differently to other third-country nationals. "I'm not in a different galaxy,” May said in response in an interview with the BBC on Sunday. "That's why you need strong and stable leadership in order to conduct those negotiations and get the best deal for Britain." Official Brexit negotiations are set to begin after the UK’s general election on June 8. Britain is scheduled to officially leave the EU on March 29, 2019.